Once, as Rusty was plodding along the road, he heard a familiar faint sound to the east, rapidly growing as spinning tyres ate up the distance between. He wondered about pulling off, but there was no lay-by or turning. All he could do was coax the horse over to the verge, and leave as much road clear for them as was possible. They came through fast – well over seventy, he judged, their engines screaming in advance, exhausts coughing behind them. There must have been at least forty of them. They passed him like Prussian cavalry overtaking a civilian. A cou ple came so close that he thought they were bound to hit the cart, but they did not. 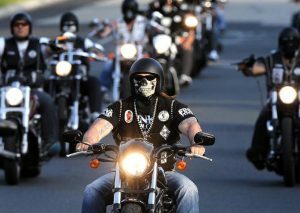 All in the acid-bleached white leather jackets, with black crash helmets. He watched them disappear into the westering winter sun, and listened to the silence that spread back over the empty fields. He was as indifferent to them as they to him. It had been a good day, and he was on his way home, to his family. Next story Why should brutes fare better?